Roasted cauliflower is spiced with cumin and smoked paprika, tossed with Brussels sprouts, radicchio and roasted red peppers, then tossed in Sesame Honey Dressing. Garnished with pickled onions and salted sunflower seeds. Combine spices. Drizzle cauliflower in olive oil and season with spice mixture. Roast in a 400°F oven until tender and slightly charred. Combine ingredients and whisk to incorporate. 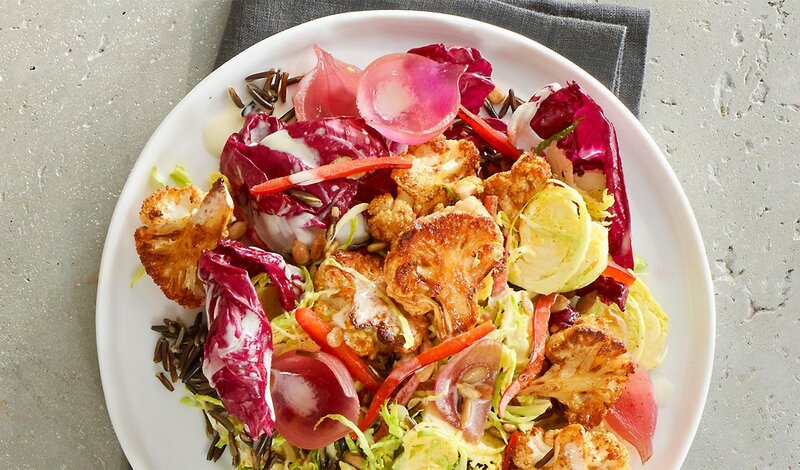 Combine dressing with Brussels sprouts, radicchio, and roasted red pepper strips. Top with remaining ingredients.